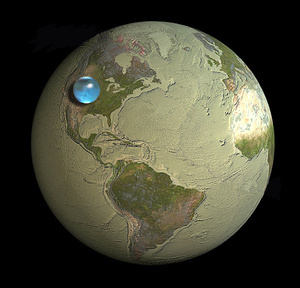 This is really cool…the image here shows how much water there is on Earth, if you were to gather it all up in a ball and compare it to the size of the whole planet. It really puts things in perspective, doesn’t it? Now, take this a step further, and think about the water on this planet compared to others in our solar system. Our little blue marble in space seems to be the gem, the most water-rich planet orbiting this star. Well, it turns out that’s not exactly true, if you count moons at least. 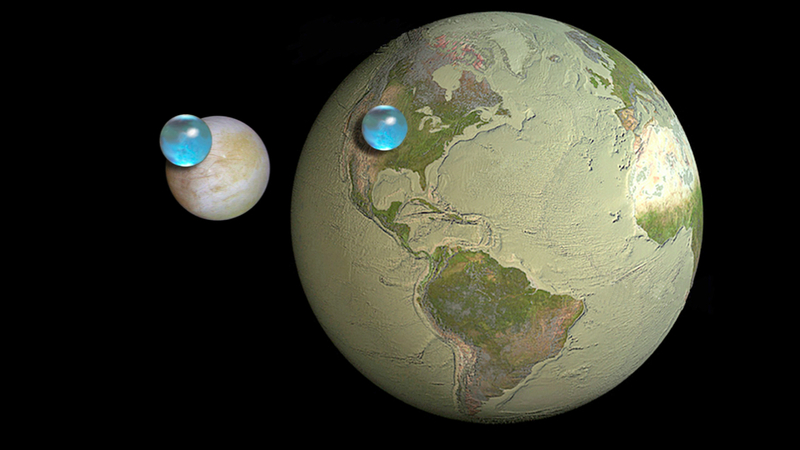 Check out the picture below, showing the water on Earth, compared to the estimated water on the moon Europa! In terms of volume, Europa is estimated to have two to three times the volume of water that Earth does. Incredible! There are a couple interesting threats to the security of our future water supply. The first involves depletion of groundwater for agricultural uses. Already, we’re using it at an unsustainable rate, and the future viability of irrigated agriculture is, at this point, somewhat uncertain in some areas. However, as this article points out, there’s more that can be done using existing technology to decrease water usage, like more efficient watering methods (drip irrigation, for example) and construction of more water storage systems. That takes money though, either with higher food prices, and/or government infrastructure investment. In the current political and economic climate, the later is unlikely, so expect higher food prices to hit first before public pressure creates the political will to improve the infrastructure. The second development that is going to place increasing demands on our water supply is electricity, strangely enough. As this article explains, most modern power plants require large amounts of water in order to cool them. Well, the power plants that aren’t using renewable energy like solar or wind, that is. Then of course, there’s fracking, which not only pollutes the groundwater, but uses a lot of water as a primary ingredient in the fracturing fluid that’s pumped underground. Sort of a double-whammy there. So what does this all mean? It means that like many other things, we’re nearing Peak Water, where the supply of water will be less than the demand. Or rather, the supply of clean, drinkable water. We’ll likely be forced to turn to more expensive filtering methods to increase the drinking water supply, and for coastal communities, it’s hard to imagine a world without desalination being key. Costs will increase. Over the past forty years or so (1961-2003), global sea levels have risen an average of .07″ per year. Global warming is largely the culprit here, but scientist have struggled to truly make that hypothesis work. You see, when you account for global warming’s effects on the oceans (slightly lower density at higher temperatures, and melting ice), the numbers don’t add up…that only accounts for about .04″ of the .07″ per year rise. Where’s the rest coming from? Scientists in Tokyo believe the answer is all around us. Or rather, it IS us…the extra water in the oceans is due to extraction of water from underground aquifers over the past many decades, which is not being replenished at the same rate. So why does this matter? Look, the aquifer levels are decreasing (in many areas at least). Forget the ocean for a minute, our lifestyles are not sustainable like this and it’s immoral to pass this problem on to future generations, not when we see it happening around us and have the technology to fix it. Based on current sea ice melting trends, sea levels are expected to rise 3-5 FEET by 2100. Living a sustainable lifestyle with water usage can help with that, though we really need to be addressing global warming as well. Water supplies in our country are not only facing pressure from an increasing population, but climate change is likely to make the problem worse. So bad in fact, that by 2050 more than one in three counties in the US could face either a high or extreme risk of water shortage. Most likely, this will affect southern and southwestern states, and the southern Great Plains states. Read more over at sciencedaily.